The perfect event venue for your wedding reception, business luncheon, awards ceremony, fundraiser, or seminar, we will customize your ballroom to suit your needs. We are centrally located on Route 30 in Merrillville, Indiana, minutes from I-65 and the largest freestanding banquet facility in NWI. 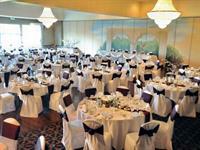 With over 16,500 square feet of meeting space, we can accommodate events of virtually any capacity. Each ballroom has floor to ceiling windows with glass doors opening out to the patio surrounded by the lush scenery for guests to enjoy. We offer events from 20 guests to over 1,100. We’re dedicated to making sure your next event is memorable and stress-free; let us handle the details while you enjoy your event. We will design a floor plan to best suit your specific needs and assist in planning your menu, linens, audio visual needs, and customize every detail to ensure a unique experience for every client. Do you have another location in mind or planning an office party? Allow us to cater it for you. We can deliver it, you can pick it up, or we can come with full service!